While I’m still progressing on my marathon training, I have had a few weeks where I haven’t stuck to the schedule. It’s been a little frustrating but I know I’m going to be well prepared for the marathon. Lately I’ve had some pain on the outside of my left knee, and I’m afraid that, yet again, my shoes are part of the problem. 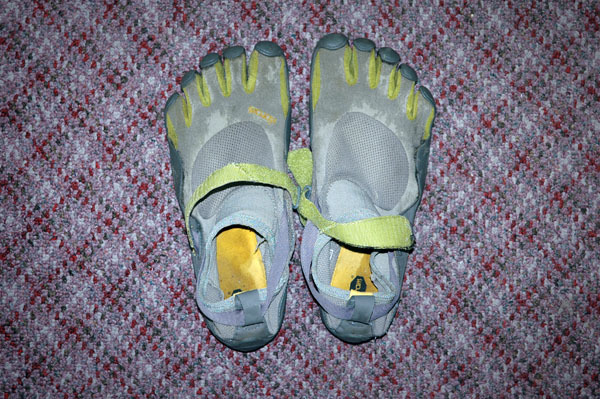 I think that switching shoes since my Nike Free 3.0s wore out has left my form pretty messed up, so I’m once again working my Vibram Five Fingers into my weekly routine. I think with my new Saucony Kinvaras I tend to twist my left leg, and I’m not exactly sure what would be causing that. It’s possibly either the extra padding in the Kinvaras or the fact that I’ve gone from the super light Frees to pretty heavy Nike Humara Considered trail shoes to the Kinvaras without making sure my form is still efficient. I live a slightly more interesting life than this. Really. Those are the ugliest “shoes”.